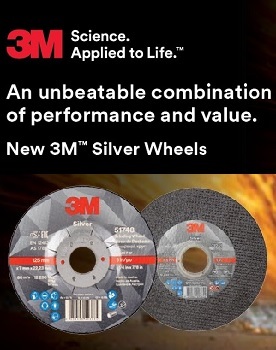 3M Silver Series Grinding and Cutting Wheels represent a new class of right angle abrasives designed to deliver an unbeatable combination of performance and value. Powered by the legendary speed and long life of 3M Precision-Shaped Grain, these Advanced Series Abrasives are ideal for a wide variety of metalworking applications. 3M Silver Series Abrasives offer a longer life and faster cut than aluminum oxide, alumina zirconia and other conventional ceramic abrasives. 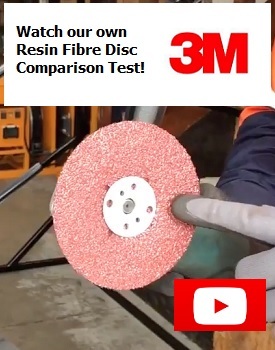 The 3M Silver Cut-Off and Depressed Centre Grinding Wheels feature the unique 3M Precision-Shaped Grain which continually fractures into super-sharp points and edges that slice cleanly through metal, rather than gouging or plowing as traditional abrasives do. This also helps it to last significantly longer than conventional ceramic grain abrasives while maintaining a high cut-rate over the life of the wheel. 3M Silver Cut-Off can be used to deliver a fast and consistent cut through pipe, tube, flat sheets of stainless steel, mild steel, aerospace alloys and more. 3M Silver Depressed Center Griding wheels deliver a fast and consistent cut during grinding and heavy stock removal on Stainless Steel, Mild steel, aerospace alloys and more. Click Here to request a 125mm Silver Cutting or Grinding Disc sample. Follow these links to the 3M Silver Series Cut Off Wheels. Follow these links to the 3M Silver Series Grinding Wheels.